Welcome to my website. My name is Odell Archibald and I have been painting since 2002. My first reproduction was “Special of the Day”. I remember being so proud and excited over this painting. I have the original displayed in my home. 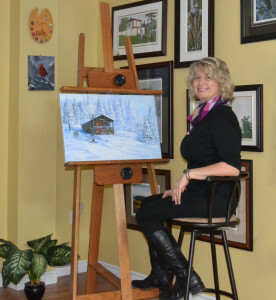 Over the years I have enjoyed painting at my studio located in downtown Stephenville NL. I love painting birds, fences, fish shacks and children. My two favorite painting are Cat Tails and Two Little Chickadees. Please browse through my reproductions and original work, hopefully you will see something that you like. I reside in Kippens, NL with my husband Sandy and I have three sons. I have lived in Stephenville Crossing, Corner Brook, Burgeo and the Burin Peninsula. I love living near the water and my husband and I spend a lot of time at our cottage in Flat Bay Brook. We love to salmon fish and enjoy the outdoors so much. We also travel a lot which takes me away from my studio but I always find my way back. Working mainly in acrylic, I have learned over the years that I like to keep my edition size for my reproductions at a low number. It seems my customers appreciate this. I teach acrylic painting to groups and also hold private lessons at my studio. 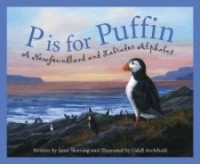 The unique visual and spoken language of Newfoundland and Labrador is celebrated in this collaboration by illustrator Odell Archibald and author Janet Skirving. Archibald makes a painting for each letter in the alphabet. Archibald’s work is colourful, detailed and textured. These unforgettable scenes combine with thoughtful text from Skirving, perfect for anyone and everyone who’s visited – or wants to visit – the beloved Rock.